So the shows underway and it's been a ton of work and it's only going to get worst but I'm enjoying it and everything. I'm about to enter the sleepless nights phase of animation and directing, but that's ok. If what you love is keeping you up then you'll never truly get tired. In the mean time I've been on creative overload. I've been using the fact that I have no internet or TV or Cintiq in my possession (I leave it at work for animation purposes) and have just been writing scripts to my imaginary show. It's been super helpful for me developing she show and to understand the characters better. I'm going to probably end up doing a complete overhaul on some of them in the pitch bible because they are just so different now. Hopefully I can get a ton done and try to pitch it soon. Also don't think I forgot about my new film project TRICK. 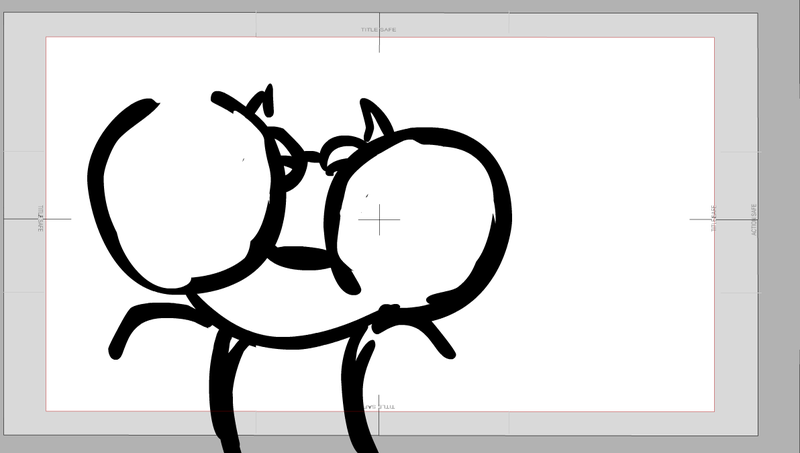 I've been storyboarding tonight. Here's a random frame from it, that hopefully will explain nothing. Anyway, life's nice and I'm just gonna keep on plugging on my own work and hope that it amounts to more than a hill of beans. PEACE OUT HOMIES!